Mary has worked in a variety of roles, as a nurse in both NHS and in a local hospice, and 20+ years within the healthcare industry in sales and marketing. Mary has also managed a small business and helped several small businesses locally with planning, marketing and coaching. She loves spending time with family and friends and is passionate about her garden, yoga, walking and cooking. 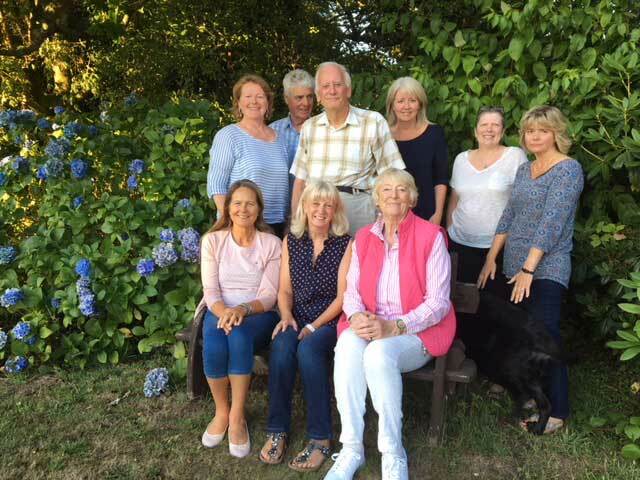 In 2017 Mary had breast cancer and this life changing episode in her life has given her the energy to set up this charity to help others affected by cancer locally. Bruce has worked as Head of IT for an international toy company for the past 17 years. He is an active member of the Lyme Regis Gig Club as well as the local Scout Leader. In 2003 he was diagnosed and successfully treated for testicular cancer. Chris Boothroyd is a long-retired teacher doing a variety of voluntary jobs in Lyme Regis and the surrounding area. He is Director of Lyme Forward (the Local Area Partnership) and chairs its Health and Wellbeing group, which encourages and assists support agencies such as Axminster and Lyme Cancer Support. Maggie is involved because of Mary, her daughter, and also awareness that there is a need for the facility for people to talk at ‘grass roots’ level. She has had breast cancer so can understand some of the concerns. Kate is a marketing manager in the IT industry and hopes to bring her marketing skills to Axminster and Lyme Cancer Support. She had breast cancer at the end of 2017 and understands the needs of those meeting similar life challenges, and the importance of local support. Following a successful career as a Sales Manager in the IT industry, Tracey relocated to Lyme Regis in 2005 and ran a successful Guest House for 11 years. Having sold the business, she moved to Seaton where she now works as a freelance administrator and property manager. I am a local GP and 3 years ago I found out what it feels like from the patients side. It has been a very steep learning curve and I want to do anything I can to make the journey easier for others.